There's a new piCture pOlish collaboration shade in town and it's called Starry Night! 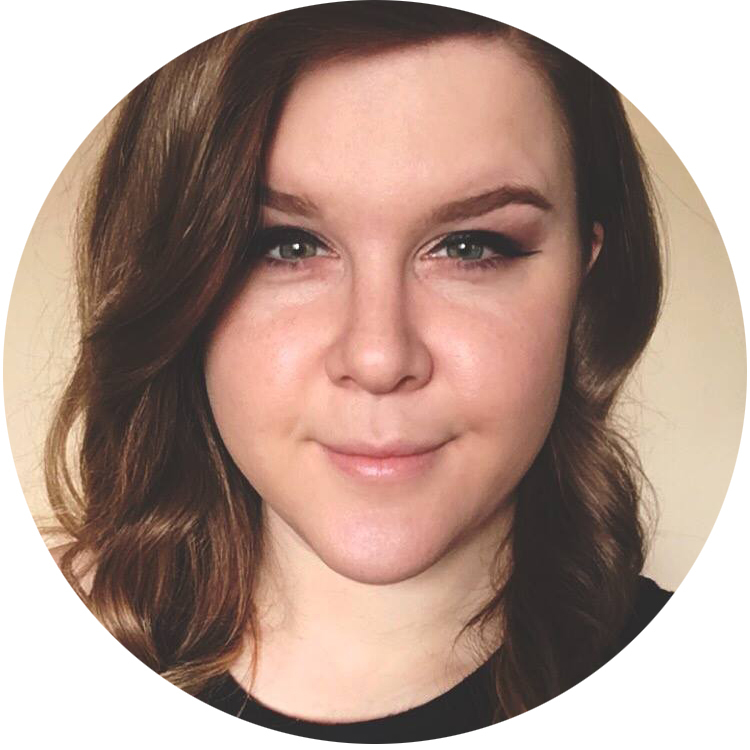 This collaborative shade was made with Llarowe and it's really quite lovely. Starry Night is a charcoal jelly scattered holo with multicolor sparks. I found that the formula was super cooperative and just the right consistency. I used three thin coats for my swatch, though if you apply your coats a bit thicker you will probably only need two. It has a very smooth, non lumpy finish and dries to a high shine. I love the irregularly shaped flecks in this. Here is Starry Night in direct light. Of course we can't forget the classic piCture pOlish bottle! 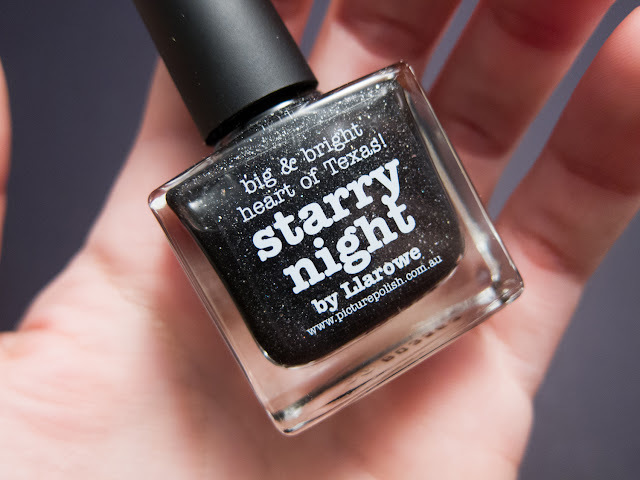 Starry Night is 11mL and is available through Llarowe for $14.50 and via the piCture pOlish website for AUD$12.00. No other US or Canadian stockists will have this shade as it will be exclusive to Llarowe. You can also follow Llarowe on Facebook and piCture pOlish on Facebook. wow! this polish is gorgeous! i love dark colors and this is just perfect! Reminds me of Storm by Zoya. Pretty! Stunning swatches as always and it looks gorgeous on you! Thank you so much! Oh wow I love this! 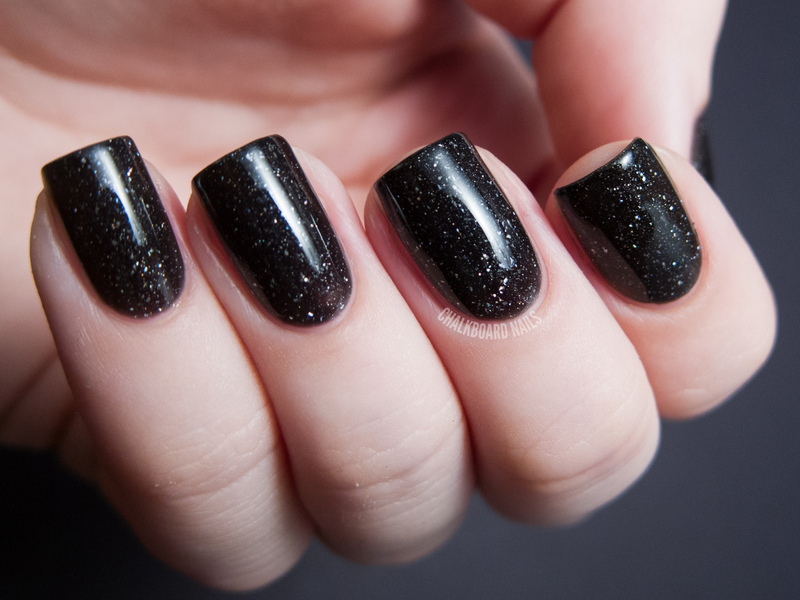 It's like the easiest way to get galaxy nails! Beautiful, reminds me of scratches. ♥ your swatches are great! OMG ! Just wonderfull ! Thanks for your amazing swatches (you've got such beautiful nails...), you're a reference for me. Just wanted to say I found your blog last night and I am a little addicted. Your nails are gorgeous and so neat!! I love the designs. I have pinned some to my nail art board so I can attempt to copy them - I have credited your blog so I hope you don't mind? So cool it reminded me so much of a night full of stars.